With the rapid growth of disruptive technology sectors, well-qualified talent is very hard to find. Also finding the right recruitment business with genuine disruptive technology experience is a minefield, with so-called sector experts trying to capitalise on a rapidly growing and evolving sector. 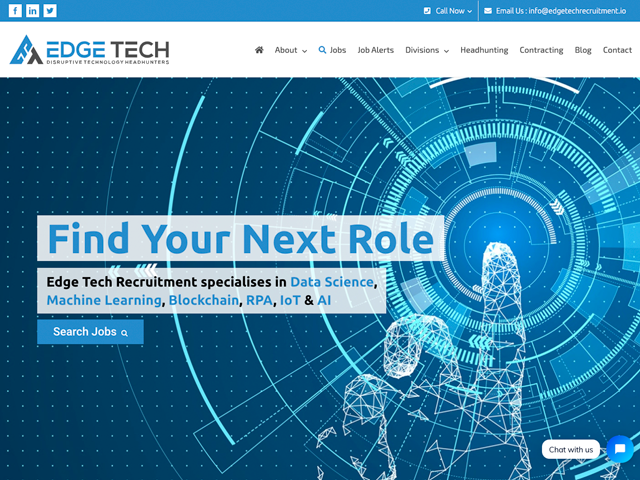 The Board of Directors at Edge Tech have 10 years of genuine market experience recruiting the best talent within emerging technologies including RPA (Robotic Process Automation), IoT (Internet of Things), AI (Artificial Intelligence), Data Science/Machine Learning and Blockchain.